The MSC Yacht Club on the MSC Divina is much like the one on the other MSC cruise ships in the Fantasia class like the MSC Splendida. 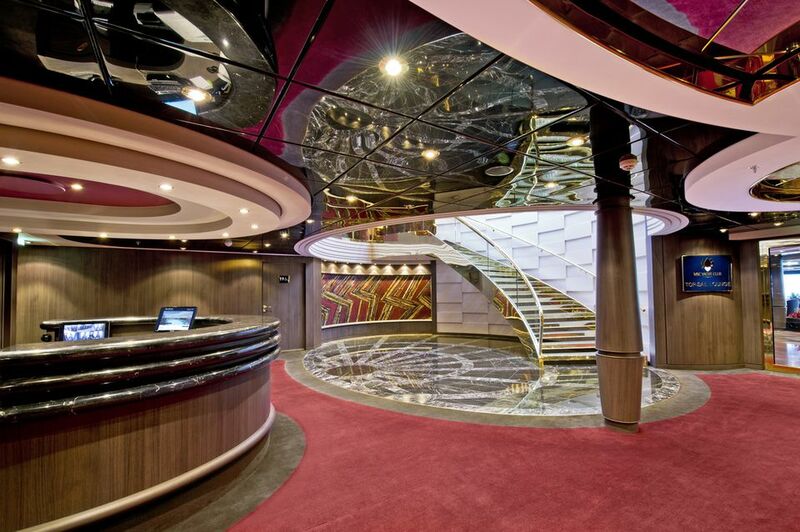 It's an exclusive "ship within a ship" sanctuary, with suite accommodations, Concierge reception area, lounge, pool and bar area, plus a private restaurant and private access to the MSC Aurea Spa. Those staying in the MSC Yacht Club can enjoy complimentary wines, spirits, and gourmet snacks in the Concierge lounge, along with Butler service in their staterooms or suites. The spectacular views of the sea from this Deck 15 Lounge also make the Yacht Club a guest favorite. The MSC Cruises' ships with Yacht Clubs include MSC Divina, MSC Fantasia, MSC Meraviglia, MSC Preziosa, MSC Seaside, MSC Seaview, MSC Bellissima, and MSC Splendida. The Top Sail Lounge in the MSC Divina Yacht Club is a quiet place to have a drink, enjoy a snack, or just appreciated the exceptional views of the sea. It is an exclusive area for those staying in the Yacht Club staterooms and suites. Those staying in the MSC Yacht Club can enjoy nightly canapes and other snacks along with a complimentary drink in the Top Sail Lounge. Guests staying in the MSC Yacht Club can enjoy light bites in the Top Sail Lounge, but they also have access to a dedicated restaurant for dinner. The menus in this special restaurant are exciting and sophisticated, and unlimited drinks are included with each meal. On the MSC Divina, the dedicated Yacht Club restaurant is named La Muse, and it is located aft on deck 15. The Sophia Loren Suite on the MSC Divina is one of two Royal Suites on the large ship. The suite was designed by Sophia Loren and has a separate sleeping area. The decor is mostly red, and the walls are covered with photos from her movie career. The suite has a separate bedroom and measures 390 square feet with a 172 square foot balcony. Photos of Ms. Loren in some of her famous movie roles adorn the walls of the suite, and occupants can sit at a replica of her dressing table to apply makeup and style their hair. However, sitting at this dressing table probably won't make you look like Sophia Loren, but might give you an extra boost of confidence. Doesn't this bed look like it was designed for a famous movie star like Sophia Loren? The red certainly looks like it is fit for a diva. Those staying in one of the 62 MSC Yacht Club suites on the MSC Divina can enjoy all the yacht club amenities, including 24-hour butler service. These suites measure 234-283 square feet, plus a 61 square foot balcony. They aren't as spacious or distinctive as the Sophia Loren Suite but are very nice (and less expensive). The MSC Divina has two wheelchair accessible deluxe suites in the exclusive MSC Yacht Club area. They measure 356 square feet and have a 39 square foot balcony. Le Muse is the private restaurant for those staying in the MSC Divina Yacht Club. This restaurant is located aft on deck 15 and features fine food and panoramic views of the sea.